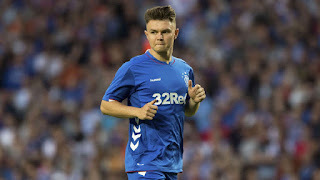 There were a lot of mixed outcomes from last night’s hard-fought victory v Macedonian side FC Shkupi, and Ibrox Noise sure covered a few of them post-match, but one of the stand out positives was the continued emergence of 18-year old Glenn Middleton who used his substitute cameo to aplomb and carried on the excellence he’d shown against Bury. Indeed, one of the few players to look as good in the Europa League as he did in a friendly, Middleton played with no fear, with the exuberance of youth but the maturity of one many years his senior. The more we see of this young lad, the more we start to be convinced he’s the real deal – with no pretentions and biding his time, Middleton has waited patiently in the Development Squad for his chance, and whatever we thought of Gerrard’s tactics last night, his decision to bring the ex-Canary on was a good one. Lest we forget, Norwich fans did not want this kid to go. In short, their complete nonplussed attitude when Graham Dorrans was sold was quite the opposite when it was Middleton moving on. This Northampton-born lad had most of us in disbelief when he retained the ball against around four Shkupi markers and still won the corner. The Matt Damon/Leo DiCaprio lookalike was the most dangerous player for Rangers last night and if he is nurtured correctly, not burned out, and utilised optimally, Rangers have a future star on their hands. Early days in his career, but right now he looks a huge success. Well played! He has the potential to be a £10-15m player!